More and more of us are working from a home office. One article notes that, in 2013 approximately 3 million Americans worked from a home office. This number is expected to grow. Those who work for employers from a home office enjoy it. Most employers also like employees working in their home office. Two-thirds of employees who work from a home office are more productive for a variety of reasons: the flexible hours, less interruption from coworkers, better time management, and a sense of empowerment. I have always had a home office to separate my work life from my home life. Over the years I have tutored students, and have taught college. I have used my home office to tutor, do consulting work, write meeting agendas and the minutes of committee meetings of non-profit boards I have served on, plan my classes, and grade student papers. I have used my home office to write research papers and a book. Over time, however, my home office took a life of its own and morphed into a dumping ground. It became the room to store or throw all kinds of things into. Things that needed to be in their proper place were tossed into my home office. Currently, I am not tutoring or teaching college so I have more free time. I now have more time to write. I have time to set goals and work toward achieving them. Earlier this year I published a piece on Thrive Global on how to set goals and be productive in 2017. I practice what I preach, or at least I try. One of my goals for 2017 was to purge my home office, give it a makeover, and transform it into my writing sanctuary. 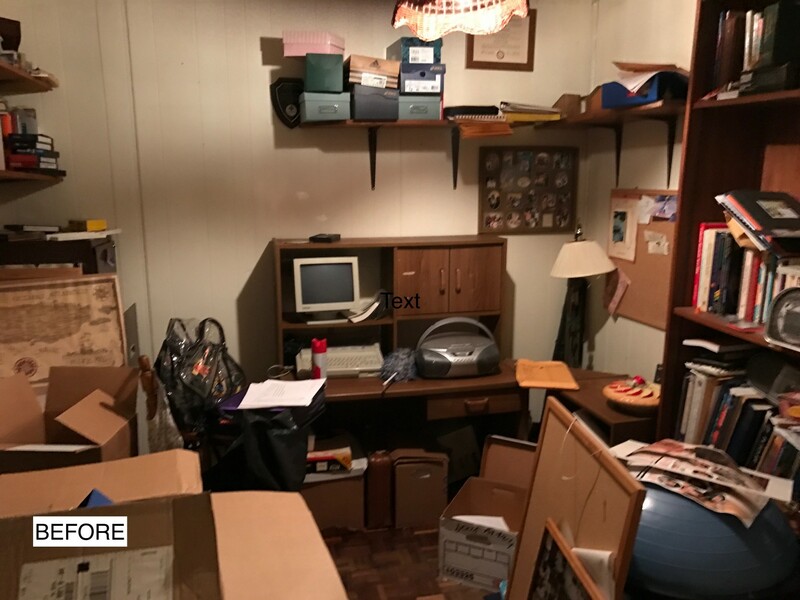 To transform my home office, I purged it, planned its makeover, and paced myself. 1. I boldly went into my 10 x 10 home office, which has one corner window facing the sunny south sky. I just started purging. In contractor trash bags, I dumped everything I did not need or had not looked at in over 20 years. I dumped 80% of the contents in my file cabinets. I dumped 90% of the contents in my desk drawers. I dumped most of the crap on the bookshelves and bookcases, except for the books. I donated the books to Goodwill. Items that I no longer needed but that someone might appreciate — one person’s garbage is another person’s treasure — I placed curbside. My old swivel chair was quickly plucked. 2. Once my home office was cleansed of what ailed it, I looked at the freed empty space and began planning its makeover. I envisioned no bookshelves but I kept one small bookcase. I kept both file cabinets. I envisioned a new simple wooden desk with only one drawer, and a new swivel chair. And then I envisioned a writing sanctuary with four yellow walls. 3. Before I painted the dingy white ceiling and the dingy eggshell white walls, I spackled the nail holes and removed the old moulding. 4. I painted the ceiling first — a bright white. Next, I painted the walls Smiley Face yellow. 5. I recruited my husband and son to measure, cut, and hammer in the moulding. We can’t always do it alone. 6. Then I went shopping with my son for a new desk, chair, lamp, and an area rug. 1. Purging — 17.5 hours over 5 consecutive days. I devoted 2.5–3.5 hours each day. 2. Painting — 10 hours over 2 days. The first day, I painted 6 hours; the second day, I painted 4 hours. 3. Moulding and decorating — 3 hours. 4. Total days and hours — 30.5 hours over 8 collective days. I began purging on Friday, March 14 — a snow day. I sat in my new writing sanctuary on Saturday, March 24. 8. Time & Labor — priceless! 1. Three antique chairs from the living room now have a new home. 2. My banker’s lamp from my college office brightens my new desk. 3. My ultrarunning race bibs displayed on the kitchen corkboard and my half-marathon and marathon bibs in my old desk drawers have a new home in old poster frames and are now art. 4. My undergraduate, graduate degrees, and award plaques from my college teaching days adorn one wall. 5. The framed front cover and back cover of my first book, which hung in our half-bath, accompany a couple of framed articles I wrote years ago. 6. A small cactus plant that I received from a student over 15 years is now 6 feet tall and basks in the south window sun. 7. The new area rug greets my bare feet. 8. High above my chair hangs a piece of left over baseboard that my husband and I recycled. He helped me to stencil and paint one of my favorite scripture passages: Come What May; I Want to Run — 2 Samuel 18:23. And write, too! The contents of my file cabinets and my old desk that were not purged are boxed, labeled, and housed in the attic. The question now is what to purge and transform next — the attic or the coat closet? What room do you need to purge? Whether it’s your home office, your coat closet, your attic, or which ever needs you the most, just do it! Make it a goal. Plan. Envision. Pace yourself. You don’t need a big budget. Recycle and reuse to decorate and transform old space into your new sanctuary.